I got word on July 17 that the BBC chiefs are cancelling the 9-year show, World Have Your Say (WHYS). To say that I’m disappointed doesn’t begin to convey the sadness of this news, as it played an important part in my life. Are Parisians Really that Rude? Well, no. No more than residents of any other big city. I wrote to the producers about a great experience I’d had on the metro the other day that showed how kind Parisians could be to people who were clearly not French. They responded immediately, and I wound up speaking for the first time on international radio. I didn’t really get to talk about that wonderful metro experience, but I loved getting to participate and hear other people’s ideas on the subject. More topics arose as I continued to follow the program. I signed up for the daily emails that I read religiously. I would promise myself I wouldn’t respond before my morning coffee, as my reactions to the questions posed were sometimes fairly strong. Their philosophy was to gather people from all over the world to get their viewpoints on current events. It was brilliant. I was at times uncomfortable reading and hearing people from parts of the world that were far more conservative than the U.S., with no concept of reproductive rights or even that women had rights at all. But over time, I learned to listen and appreciate how singular my culture was and what life was like for other people. Soon, I got to bring my own program to WHYS that surely made almost everyone squirm: a discussion of The Blasphemy Challenge. 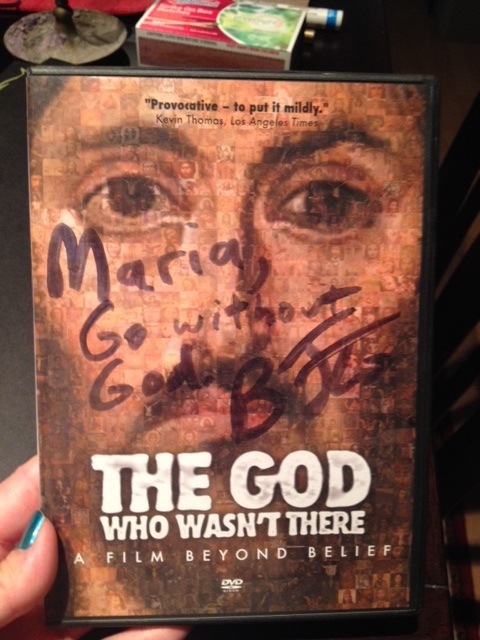 The filmmaker Brian Flemming was offering everyone who uploaded a video of themselves blaspheming the Holy Spirit a free DVD of his brilliant documentary, The God Who Wasn’t There. I got to open the program and close it, and had the time of my life. The show was followed another day by a debate between the Rational Response Squad and people like the former assistant to the Archbishop of Canterbury. On that show, I got to get rational with people across the globe. I really enjoyed getting to know Ros Atkins, who was the head producer of WHYS. He has since gone on to head other radio shows on the Beeb. He was polished and professional, yet kind and thoughtful. He always had a moment to answer one of my emails. He had a potentially incendiary show on his hands as cultures and personalities clashed on the airwaves, yet he handled it with grace and humor. In early 2007, as I sat in a 17th-century French kitchen, he and I recorded a commercial for WHYS using Skype to explain how easy it was to use the technology to call into the show. Truly, every producer I worked with was fantastic, but Ros was my favorite. When I returned to the States in the summer of 2007, a crisis happened. One of the show regulars, a young woman named Lubna Naji from Iraq, was dangerously depressed because it was her birthday and three of her friends had been killed in the last few weeks. Ros coordinated a group of callers that included myself, a gentleman in the UK and others from various continents to talk to Lubna on the air. We assured her that life was worth living and that we very much wanted her to carry on. It seemed to work. Lubna remained a contributor at least until 2012. I have a special place in my heart for her, as she kept WHYS informed about life in Baghdad. Was the U.S. invasion good or bad? She gave us no easy answers. In the midst of ongoing chaos, she went on to graduate from medical school in 2010. It was a honor to speak with her and I’m especially glad that I got the opportunity to tell her how divided U.S. citizens were over President Bush’s invasion of Iraq. I hope I helped her and other Iraqis understand that not all Americans supported that effort. My favorite event by far was when WHYS came to Los Angeles. Style, Spin and American Politics: Live from Venice Beach took place on September 10, 2008. I sat at a table on the beach with Ros; Mark Sawyer, political science professor at UCLA; editor Ted Johnson from Variety (who had been arrested during the protests outside the Republican National Convention); and a reporter named Maria Joyouspirit who has a show on KPFK. We spoke with an array of fascinating people from all over the world — like Lance Price, who’d been Tony Blair’s spin doctor. We had a fascinating hour of political talk with people from all over the globe. The best part? Ros took me on board the BBC bus. More pictures can be seen of the big debate that happened at the Skirball the evening before on my Flickr account. Crap! Had I seriously been doing this for so long that I hadn’t explained what WHYS was to my rapidly expanding audience and network of friends? Each time I’d announced a show appearance, were they all wondering if I’d illegitimately passed myself off as an expert on yet another topic? I tried to course correct there on Facebook that day. I told them about WHYS, how that morning I’d had a very strong reaction to someone’s quote in the daily email that suggested we label certain forms of religious feeling as mental illness. I’d shot off an email to the WHYS producers that to do this would violate the very foundation of the United States and what it means to be an American. I explained how the producers had wanted me to repeat that on the show. As some of you know, my father passed away in August 2013. When I received an email from the WHYS in early October 2013 that they were doing a show about fathers and how they had affected us, I emailed them a link to my blog post about my father’s recent death (“The King of Shadows is Dead”), as well as a link to my published short story, “The King of Shadows.” Two different producers responded in separate emails. Very soon, I found myself on air with Mandy Stadtmiller (the editor of xoJane) and a handful of others talking about our dads. Although Mandy’s dad seemed the most complex and colorful, my dad was clearly the anti-father of the group. Our definitions of morality and personal responsibility had clashed my whole life. I explained how I’d often gone against his example to maintain my integrity. Do the opposite of dad, and you’ll be okay. For that hour, I let my feelings roam the international stage. If I hadn’t spoken up, I would have betrayed my memories and lifelong struggles. I discovered that day that it’s one thing to express publicly your opinion on a controversial topic. It’s quite another to lay out the bones of your life before millions. It was a powerful experience I will never forget. I knew something was up with the show when I stopped getting the daily email. I asked the WHYS team why we weren’t getting emails anymore. A producer responded that their analytics indicated people weren’t reading them. I could understand why. Everyone was getting information these days via Facebook and Twitter. Email was often reserved for the most personal communications. And even then. Then I got the news on Twitter a few days ago that the BBC Chiefs were shutting down the show. I hadn’t realized that it had been going on for a whole year before I’d discovered it that day in Paris. For nine years, the BBC gave the world a voice about the day’s headlines. And now that’s ending. As WHYS leaves the BBC airwaves, my first book is being released from Raw Dog Screaming Press. I’ll soon have a whole new platform for my thoughts and opinions through my creative work. But I’ll hugely miss the excitement of seeing that foreign phone number appear on my cell and hearing friendly British voices as they prep me for the show. I’ll miss the pounding of my heart as I respond to opinions from far-flung folk whose voices fill my ear. And I’ll miss making amazing connections with people like Mandy and Lubna. An important chapter of my life has closed, but I can say this: I listened. I spoke. And I’m proud that I did. Thanks kindly to Ros and everyone at BBC World Service. During those shows, you made me feel like an important part of the team. Here’s hoping our pathways cross again on the airways soon.